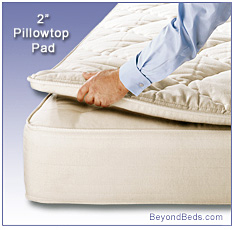 Add a layer of luxurious comfort to your bed with the Royal-Pedic organic latex mattress topper. Constructed of 100% pure wool, natural organic latex, and organic cotton, this chemical-free mattress topper will provide you with superior cushioning, support, and pressure-point relief for a great night's sleep. 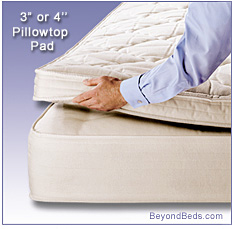 Available in 2" , 3" and 4" thickness options, the Royal-Pedic organic latex mattress topper is crafted with a thick layer of 100% organic French lamb's wool quilting and a layer of natural latex encased in 100% organic Peruvian cotton fabric. The wool, cotton and latex in the Royal-Pedic organic latex mattress topper are chemical-free, anti-bacterial, hypo-allergenic, naturally flame retardant and dust mite and mold resistant. The natural latex in the Royal-Pedic organic latex mattress topper adds a layer of motionless support and resiliency to your mattress that is unaffected by temperature changes in your bedroom. Natural latex does not transfer motion, making the Royal-Pedic organic latex mattress topper ideal for sleeping partners of differing weights and sizes. Because latex has an open cell structure designed for comfort and " breatheability," this mattress topper will allow for ventilation of body heat while increasing circulation and soothing your tired muscles and joints. The natural wool quilting in the Royal-Pedic organic latex mattress topper, is washed in three soda baths to eliminate the odors sometimes associated with wool products, while the latex layer similarly undergoes four rinses to insure that it too is odor-free. The Royal-Pedic organic latex mattress topper is heavy enough to stay put on top of your existing mattress without slipping or bunching. A simple, chemical-free, natural way to transform the surface of your bed, the Royal-Pedic organic latex mattress topper adds a plush layer of comfort and support to your sleeping environment. Note:The 2" version is a knife edge construction, whereas, the 3" and 4" thick versions have a boxed edge sidewall construction featuring French wool quilting in the border as well.